There are many options when it comes to choosing water feature for your garden, but fountains are most important and vastly versatile. They come in many styles and are made from different materials; hence you can match it to any landscape design. It can be tricky to choosing the right type of fountain for your garden to increase its appeal or else it may result in opposite effect. The fountain should be chosen depending on the size of your garden, existing styles and landscape features and the intended purpose. Fountains can change the entire appearance and feel of your garden. They provide action, sound and movement to your environment, making it lively and engaging. They provide acoustic focus, so you can be distracted from the outside the garden activities, directing your attention to the immediate space. 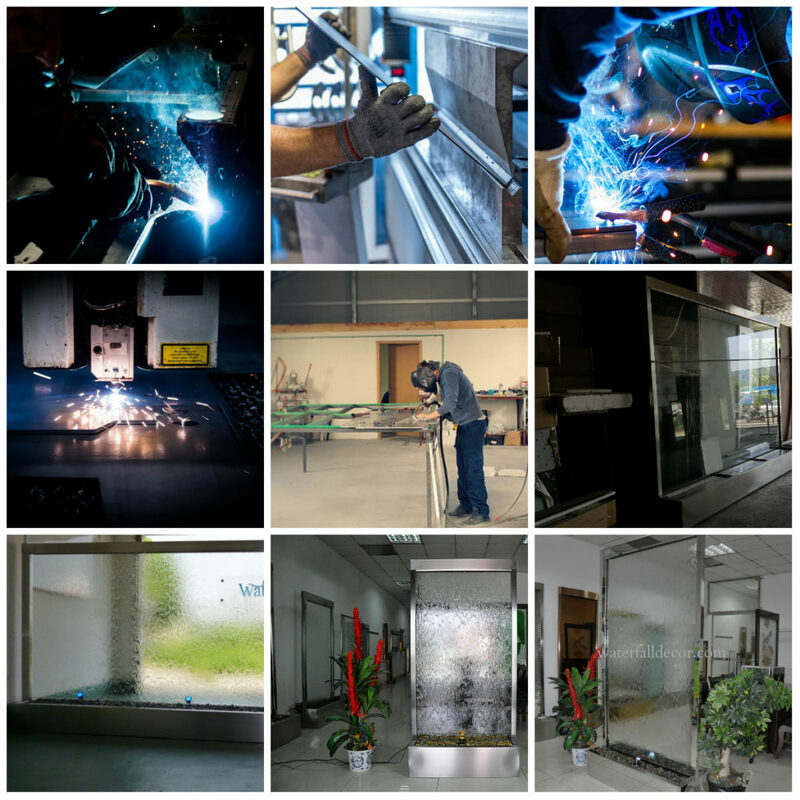 They can be customized according to the space of installation, budget and level of maintenance required. In any case, there are different types of fountains you can choose from and enjoy in your garden. 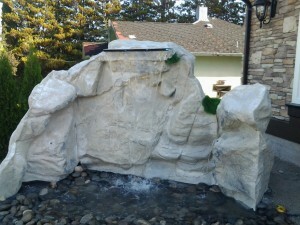 If you are looking to bring a dramatic change in your garden, a spouting fountain can be perfect for you. It comprises of a pipe that spray water up into the air creating a striking, cloud like effect. It can easily be added to any existing water feature, such as a pool or pond, because its sole requirement is a submersible pump. You can install a spouting fountain with a statue so that the water is sprayed on it or choose a design featuring nozzles spraying the water in a specific pattern, such as bubble or ring. In addition to adding a spouting fountain to an existing water feature, you can also choose a self-contained unit so that you merely have to plug the pump to provide an instant focal point to your garden. 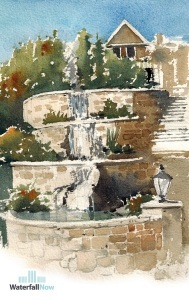 If you prefer a more subtle and delicate fountain for your garden, you can choose a cascading fountain. 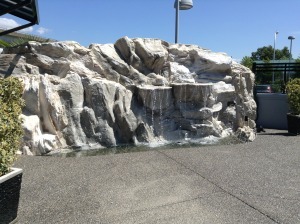 This type of fountain uses multiple levels so that water overflows from one level to the next. A popular type of cascading fountain is a traditional tiered fountain, but you can also find smaller designs where water flows through a series of pots or other types of containers. They are usually self-contained; hence the necessary plumbing is located inside the unit. 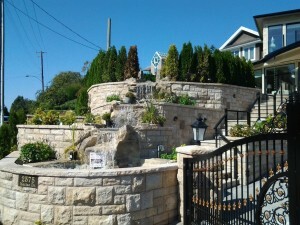 For that reason, cascading fountains are easy to add, without any hassle of hiring a plumber or fountain specialist. 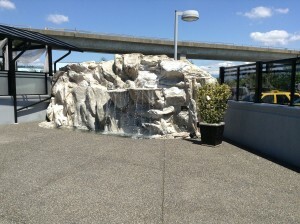 A pondless fountain is an interesting twist on the traditional water features. 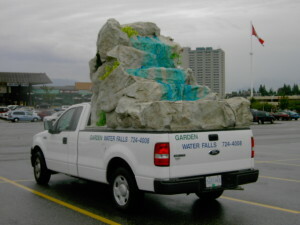 Unlike a spouting or cascading fountain that draws water from visible water reservoirs such as basin or pond, the water reservoir in pondless fountains are hidden. It does not require much maintenance and can be installed in restricted areas. 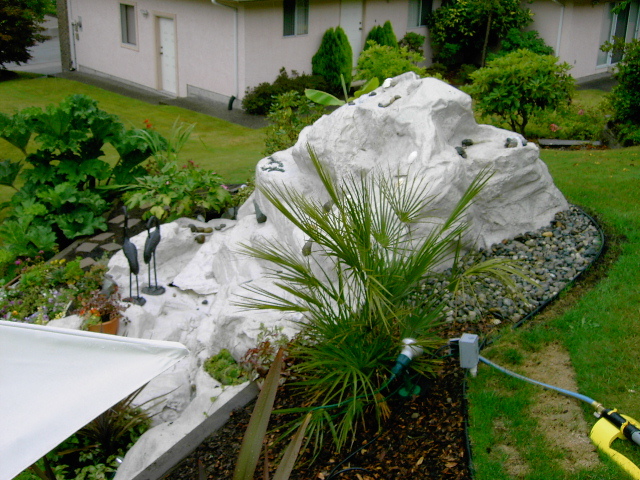 The fountain base is located on a bed of river rocks or gravels so that water is drained to the underlying reservoir. It has a subtle, modern appearance and can be installed in front or back yard. If you have a small backyard, a wall fountain can be good choice. 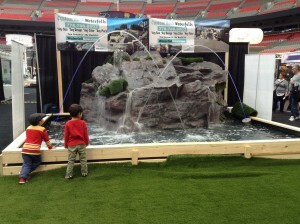 As opposed to spouting or cascading fountain, wall fountains do not require a lot of space. You can choose a freestanding style with a flat back and attached basin that you can install against a fence or wall or you can opt for a wall-mounted style that can be hanged directly on the wall and is self-contained. If you are adding a fountain to an existing wall, you will need a fountain mask added to the wall and a basin underneath to gather the water. 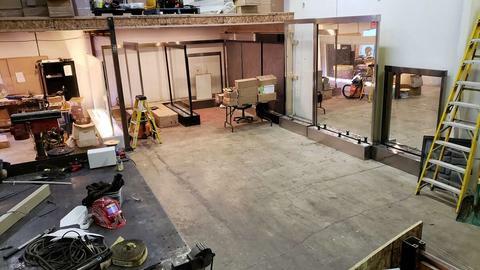 Plumbing and masonry work is involved, so you will need to hire a professional. Within each of these types of fountain types, there are very simple as well as very decorative designs. But, ensure that the fountain you choose complements the garden style or the effect can be very unsettling. In case you are doubtful about the right choice, go with a simple design as it is the safest architecturally. The landscape is usually one of the most important aspects of a home renovation project. This is because it is usually one of the first things that people will notice. In landscape architecture and garden design, a water feature may include one or multiple items ranging from ponds, to pools, fountains, waterfalls and streams. 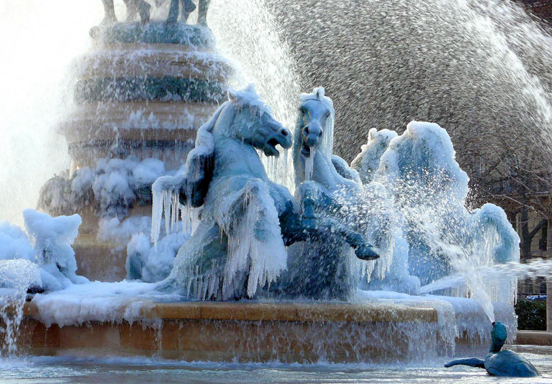 Water features have been around for many centuries. The Hanging Gardens of Babylon (1 of the 7 wonders of the world located in Mahaweel, Iraq) is an example of one of the most famous landscapes of all times – not that you need to start building one in your house! Water features are more than just aesthetics; the sounds of running water soothes your mind and soul. Studies have shown that the sound of running water subconsciously slows down your breathing, which in turn lowers your blood pressure and heart rate. Furthermore, water reduces your stress levels. When you come home from a hectic and stressful day, having a glass of wine while sitting near a water feature can help you to unwind. Five minutes of time spent by the sounds of flowing water can help reduce stress hormones. Who knows, this could end up saving your life down the road. 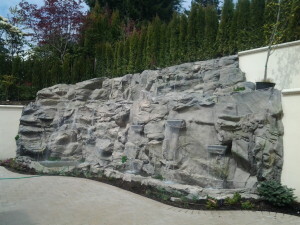 In addition to relieving of stress, there are other benefits to installing a water feature within your landscape design. 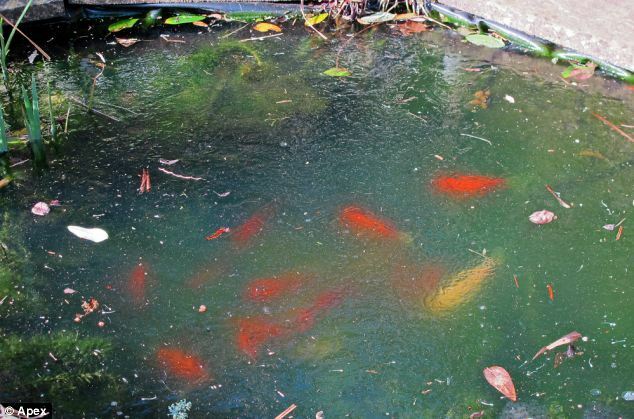 Here are five reasons to add a water feature to your garden. Anyone that has owned a water feature in the past knows that they attract wildlife – but not the dangerous type. Flowing water attracts birds, rabbits, squirrels and other adorable animals. There is nothing like waking up to the sounds of singing birds. Crows on the other hand don’t sound as good but you take the good with the bad sometimes. Anyways, if you are a nature lover, your water feature will become the most important aspect of your garden and where you will find yourself spending most of your time. You can enjoy nature without having to leave the comfort of your own backyard. Of course if you live in Vancouver you only need to take a stroll down to Stanley Park to visit one of the most beautiful wilderness parks in the world. A well designed water feature adds a lot of curb appeal to your home. If you want the most beautiful landscape and be the envy of the neighborhood, plan on adding a water feature to your garden. 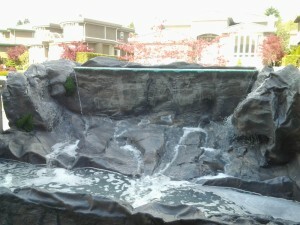 There are different types of water features for different homes. 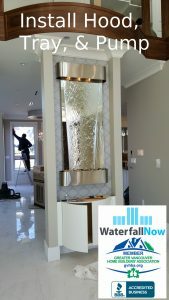 Contemporary home designs will look better with clean water walls, waterfall spillways, laminar water jets, flat concrete walls, and sleek looking statue fountains. Luxury homes looking to design a resort-like setting in their backyard almost always have a pool with an artificial rock waterfall, cave, grotto, bbq pit, and outdoor kitchen. Having a staycation can be just as fun as going on a vacation without the hassle of airports and jet lag. Homes featuring water features have been known to have higher property values than those with little or no landscape design. 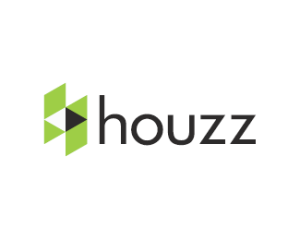 This is important in the event you ever want to sell your home. When you add a well designed and aesthetically appealing water feature to your property, the value increases instantly and your home becomes more attractive to potential buyers, giving your property a competitive property market. 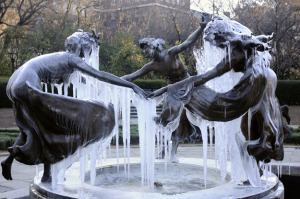 Well designed water features will operate in most seasons without ongoing maintenance costs. Like pools, a poorly designed water feature that requires constant maintenance may actually deter some people from investing in the home. One important factor to consider is whether or not the materials used to make the water feature will withstand cracking from freeze-thaw action. This is especially important in Vancouver which gets much rain, rust, and freezing temperatures in the winters. 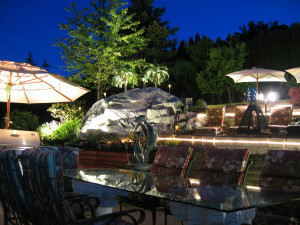 A fountain or a waterfall diminishes the noise pollution in your surroundings. Noise machines commonly use ocean waves, the sounds of falling water, and river noises, and there is a reason for that. Sounds of water are soothing and block out annoying noises like traffic or construction. Does your neighbor talk too loud? Are you are tired of hearing them talk about how bad their day was. Is your house is situated next to a busy street or the passing by cars have high music on? 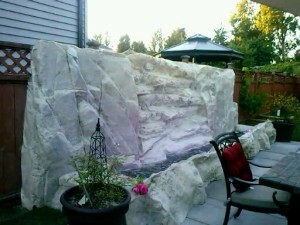 You can suppress those undesirable noises by adding a water feature with enough white noise to solve the problem. In addition, you have unlimited access to a peaceful area to enjoy the outdoors. Flowing water releases negative ions. These negative ions are tasteless, odorless and invisible molecules that we inhale. Water features such as water walls, waterfall spillways, and cascading waterfalls help toimprove air quality, which is obviously better for your health. Negative ions have mood bosting and stress relieving effects on humans. Maybe even on your pets as well. Falling water also acts as a filter for dust, pollen, and even collects animal hairs floating in the air. This is a beneficial feature to those suffering from asthma or allergies. Just make sure to clean out the water once in a while. Think back to the feeling of peace and tranquility when going to beaches, lakes or rivers. You can add a little of that to your life by adding a water feature in your garden. A garden water feature can be heard from inside your home through your bedroom window or beside your office desk if you have an indoor waterfall. It is recommended to opt for a professional landscape designer to install the water feature, so that it is done right the first time. A landscape designer can install your water feature at the most suitable location so that it feels like a natural extension of your landscape. Depending on your needs, your landscaper can also recommend the best low maintenance system to install or custom design a unique water feature that has never been done before. Even if you don’t consider yourself to be the creative type, working directly with the artist him/herself means that you helped design and build the water feature.